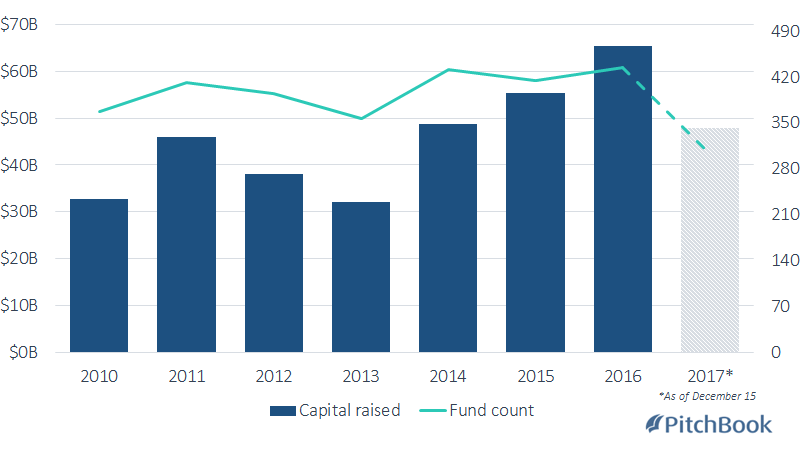 2015 previously held the mark for most venture capital invested globally in a single year over the past decade. But now it's 2017, and massive VC financings are the new normal. These enormous funding rounds have contributed to the record-breaking year, of course, but there have also been other factors. Take SoftBank, the Japanese telecom giant that's made headline after headline in 2017 with its $98 billion Vision Fund. It's made a huge impact on the tech world, participating in deals worth more than $22 billion—and that's not even including the multibillion-dollar stake SoftBank is set to take in Uber. Large fundings have led to even larger valuations. This year, more than 40 VC-backed companies reached billion-dollar valuations and joined the ranks of the unicorn club. Among the companies that have achieved that milestone in 2017 are well-known startups such as exercise bike-maker Peloton, stock trading platform Robinhood and food delivery company Deliveroo. Numbers can't tell the whole story, of course—this year has also been characterized by turmoil at the most valuable private company in the US, sexual misconduct allegations against several prominent VC investors, and layoffs and shutdowns at many VC-backed startups, among other themes—but they do provide a solid overview of the industry. We've taken a look at the figures for three key measurements of the global VC landscape in 2017. 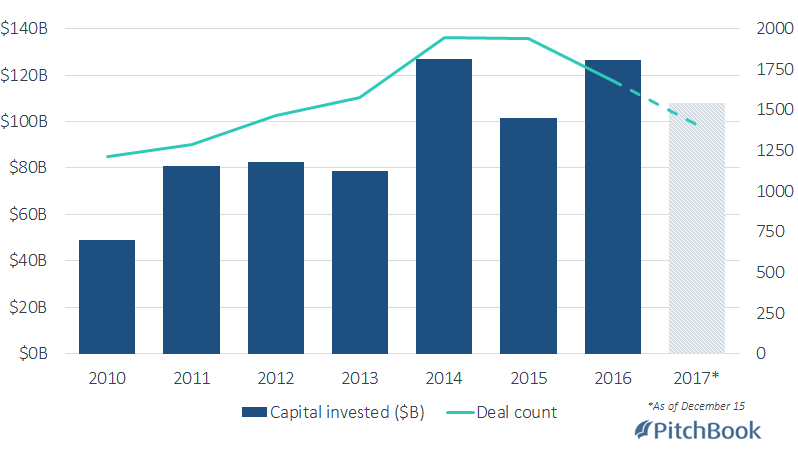 After a dip last year, 2017 has reached new heights in terms of the sheer dollar amount of venture capital invested over the past decade. VCs have poured more than $148 billion into private companies this year, per the PitchBook Platform. The previous high over the last 10 years, reached two years ago, was $142.8 billion. Deal count, however, is still falling from the 2015 figures. That year, VC investors participated in more than 19,000 deals, a number that has dropped significantly since. 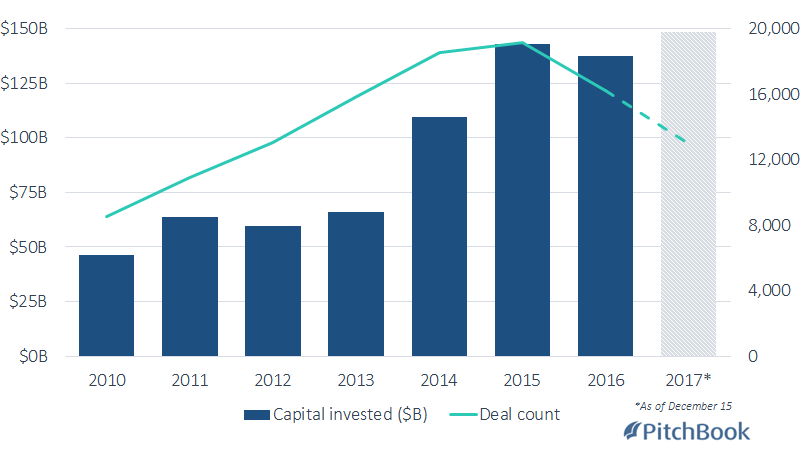 The bump in capital invested and decline in deal count aligns with one of the biggest VC trends of the year: Gigantic funding rounds. As of mid-October, eight startups in the US had raised $500 million-plus rounds. Some representative transactions are a $4.4 billion infusion into WeWork, a $1.5 billion investment in Lyft and a billion-dollar bet on Airbnb. As VC deal count dropped for the second year in a row, so did exit activity. The number of VC-backed exits around the world reached a peak in 2014 and nearly matched it in 2015, then dropped in 2016 and again this year, to about 1,400. The figures are commensurate with the noticeable lack of IPOs in the past few years. The median time to IPO has risen dramatically over the last decade, from 4.9 years in 2006 to 8.3 years in 2016. Companies staying private longer contributes to the massive VC funding rounds discussed above. The discrepancy between 2016 and 2017 is partly due to this year's relative lack of mega-funds. In 2016, nine VC funds closed on $1 billion or more—nearly double the five vehicles that reached the billion-dollar mark in 2017. Check out more of our 2017 Year in Review content.